The name refers to a five-strand natural pearl necklace consisting of 389 oriental pearls weighing a total of 4,305 grains (1,076 carats), with an enamel clasp portraying Catherine the Great, Empress of Russia and two diamond alternate clasps, believed to have been owned at one time by one of Russia's greatest Romanov rulers, Catherine the Great, a great connoisseur and collector of arts, artifacts, jewels and jewelry. The necklace apparently belonged to Catherine's personal jewelry collection, and was not part of the Russian Diamond Fund. Thus the necklace had passed down successive Romanov rulers, and had been part of the personal jewelry collection of either Czar Nicholas or an aristocratic family related to him. During the upheavals of the October Bolshevik Revolution, most of these aristocratic families escaped from Russia to other European countries, carrying with them their personal jewelry, which they were forced to sell in order to ensure their survival. It is believed that Catherine the Great's five-strand pearl necklace was also one such piece of jewelry brought to Europe by a Russian aristocratic family during the revolution, and sold either in Paris, London or another European capital. The necklace was apparently purchased by Cartier's of Paris, who dispatched it to their American headquarters in New York, and sold it in 1920 for an unprecedented $825,000, to Horace E. Dodge, the founder of the internationally renowned Dodge Automobile Company, who presented it to his wife, Anna Thomson Dodge, in whose family it remained until December 2008, when a portion of the necklace, consisting of 224 pearls and only three strands, was sold at a Bonham's auction in New York. Thus the name of the pearl necklace appropriately reflects the name of its two previous owners, Empress Catherine the Great of Russia and Anna Thomson Dodge of the United States of America. According to a Cartier sales invoice issued in the name of Horace E. Dodge Esq. dated May 24, 1920, the date of purchase of the necklace, the item sold was a five-row natural pearl necklace, consisting of three hundred and eighty-nine (389) pearls, with a total weight of forty-three hundred and five (4305) grains equivalent to 1076.25 carats, accompanied by an enamel clasp representing Catherine, Empress of Russia, and two diamond alternate clasps. The necklace was described as versatile, that allowed its owner to change the combination and style of the jewelry. In other words the necklace was interchangeable for example into a brooch or bracelet or vice versa. 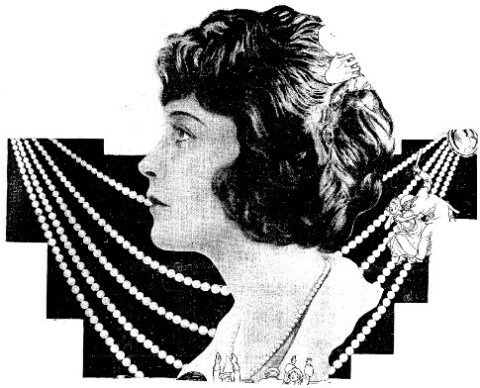 Photograph of Anna Thomson Dodge 5-strand pearl necklace partly covered by a close-up of Delphine Dodge that appeared in the Lima News in 1922. A black and white photograph of the famous Dodge necklace appeared in the magazine section of the newspaper THE LIMA NEWS, published in Lima, Ohio in 1922, after the necklace was gifted by Anna Thomson to her daughter Delphine Dodge, wife of James Cromwell. The five-strand pearl necklace appearing in the background, is partly covered in the center by Delphine's close-up photograph, showing her wearing a comparatively valueless single-strand pearl necklace, instead of the $1.5 million Dodge pearl necklace, which was hidden away in the dark recess of a safe vault, belonging to the biggest trust company in Philadelphia. The photograph shows the five strands of the festoon pearl necklace originating from the clasps at either end, with an enamel miniature representing Catherine the Great, at the right hand end of the necklace. The strands appear to be made up of perfectly matched natural pearls, gradually decreasing in size towards both ends of the necklace. The shape of the pearls in the necklace are not all spherical, but has a variety of different shapes, such as spherical. near-spherical, button, oval and slightly baroque shapes. A mathematical estimate of the size of the pearls in the necklace, given the number of pearls and their total weight. Apart from the number of pearls in the original necklace and their total weight, nothing had been said about their size, color, overtones, luster, orient, surface quality etc. However, given that 389 pearls had a total weight of 4305 grains, the average weight of each pearl is equal to 4305/389, which works out to approximately 11 grains or 2.75 carats. The size of the pearl given in terms of weight can be converted roughly into size in terms of diameter, using the table given below, provided by the Shima Pearl Co. of Japan for cultured Akoya pearls, assuming that the data applies to natural pearls as well. In this table the size of the pearl in millimeters has been related to the number of pieces per "momme." The "momme" is an ancient Japanese unit of weight equal to 3.75 grams or 18.75 carats. According to this table the number of pieces per "momme" of pearls of diameter 7mm is equal to 7 pieces. 7 pieces per momme is the same thing as 7 pieces in 18.75 carats. The weight of one piece is equal to 18.75/7 = 2.68 carats. The same calculation applied to pearls of diameter 6.5 mm and 7.5 mm gives the weight of one piece as 18.75/9.3 and 18.75/6, which is equal to 2.02 carats and 3.13 carats respectively. The average weight of each pearl in the necklace is 2.75 carats, which is between 2.68 carats and 3.13 carats, equivalent to a size of 7mm and 7.5 mm. Thus the average size of the pearls in the necklace is between 7mm and 7.5 mm. A size of 7 - 7.5 mm is considered large for Akoya pearls, but for South Sea pearls it is considered as medium. The pearls in the necklace are most probably natural oriental pearls, given the period of its origin - late 18th-century. Accordingly these pearls must have originated from the pearl oyster species, Pinctada radiata, the predominant species of pearl oyster found in the Persian Gulf, the Red Sea and the Gulf of Mannar, related to the Akoya pearl oyster, Pinctada fucata martensii. Thus the pearls in the Anna Thomson Dodge/Catherine the Great Pearl Necklace can also be considered as large pearls, similar to Akoya pearls. How five strands became three strands ? Anna Thomson Dodge's five-strand pearl necklace was inherited by her heirs, and was eventually dismantled into five separate strands, each strand being inherited by a different family member. 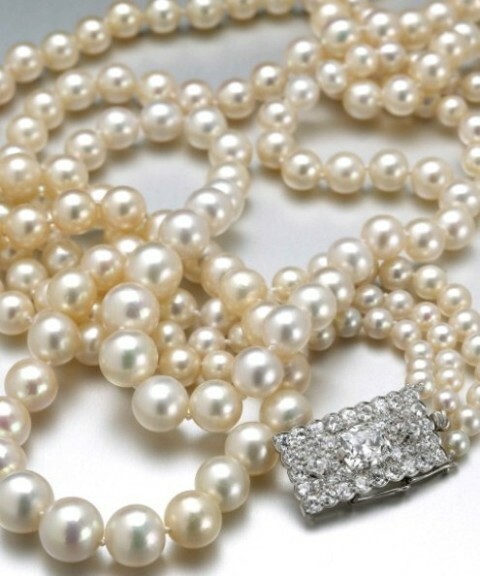 However in 2008, three of these family members decided to reunite their individual natural pearl strands into a single three-stranded pearl necklace, with a view of disposing it by public auction, perhaps motivated by the December 2007 auction of a 14 inch single strand natural pearl necklace, made up of 28 natural pearls, once owned by Queen Mary and the Duchess of Windsor, that sold for $3.6 million, setting a new world record for the price realized for a natural pearl necklace at an auction. The reunited three-strand natural pearl necklace consisted of 224 pearls, and two Cartier diamond clasps, perhaps indicating that the pearls in the necklace were re-strung by Cartier, just as the original necklace. It is not known whether the diamond clasps used were the original signature Cartier diamond clasps, or new clasps belonging to the company. The original Catherine the Great pearl necklace, were however strung together in Russia by jewelers to the imperial court of Russia. Cartier after purchasing the necklace in 1920, appears to have re-strung the necklace, adding their signature clasps. Except for the number of pearls in the three-strand pearl necklace, most other features of the pearls in the necklace are not known. However, this time we have the benefit of examining photographs of the necklace, both full length as well as close-ups, and certain features of the necklace can be described using these photographs. The three-strand pearl necklace appears to be made up of perfectly matched graduated pearls, with larger pearls towards the lower end of the necklace, and the size of the pearls gradually decreasing towards the rear clasps. Most of the pearls appear to be spherical or near spherical, a shape that is very rare in natural pearls. Given the scarcity of natural pearls in general and the extreme scarcity of spherical natural pearls in particular, one can easily imagine the difficulties that would have been encountered in putting together a collection of matching pearls for this necklace. This partially explains the staggering $825,000 paid by Horace E. Dodge when he purchased the necklace in 1920. The color of the pearls appear to be white, the most sought after color in pearls, with a slightly pinkish or yellowish overtone. The color is characteristic of oriental pearls originating in the Persian Gulf, the Red Sea and the Gulf of Mannar The luster and orient of the pearls are also of the highest quality, in keeping with natural saltwater pearls. The surface quality of the pearls also seem to be excellent, but without any doubt the most striking feature of the pearls is their regular spherical shape, which almost looks like cultured Akoya pearls of regular sizes and shapes!!! The Cartier double clasp is rectangular shaped and appears to be made up of platinum or silver, set with a central cushion-shaped diamond, surrounded by smaller spherical rose-cut diamonds. There are 24 spherical and rose cut diamonds lining the outer edge of the clasp. Perhaps the old-cut of the diamonds in the clasp indicates the antiquity of the necklace. The three strands of the necklace are fixed to the clasp on either side by rings. 1) The strongest evidence that the necklace once belonged to Empress Catherine the Great, one of Russia's greatest Romanov rulers who ruled between 1762 and 1796, was the presence of an enamel clasp in the necklace with a miniature portrait of Empress Catherine, as stated in the Cartier's sales invoice issued to Horace E. Dodge in 1920. 2) The second evidence that supports this view was the assurance given by Pierre Cartier himself to Horace E. Dodge at the time of purchasing the necklace in 1920, that the necklace belonged to none other than Empress Catherine the Great of Russia. Cartier being a renowned jewelry firm with a worldwide reputation, and an international clientele that included monarchies and aristocratic families around the world, and the rich industrialists of Europe and America, will never deal with a necklace of dubious provenance, just to enhance its profits. Cartier would have no doubt verified the provenance of the necklace before purchasing it. Thus if Cartier had said that the necklace belonged to Catherine the Great, it is with a sense of responsibility that they would have made that statement, leaving little room for anyone to cast any doubts about its credibility. The time of purchase of the necklace in the early 20th-century, a period when Romanov jewels reached the west in large quantities, when their owners escaped the Bolshevik Revolution. 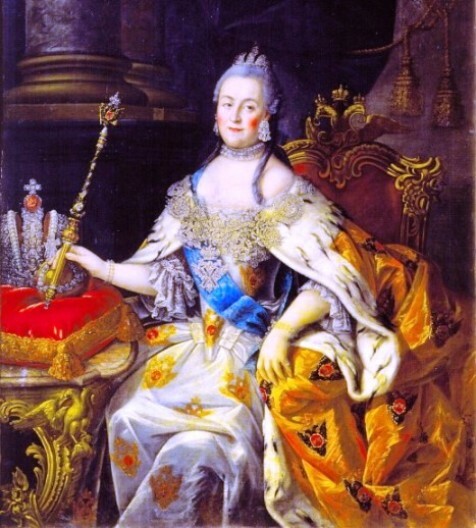 3) The third strong evidence that supports the view that the necklace once belonged to Catherine the Great, was the time of purchase of the necklace, the year 1920. This was the time around which large quantities of jewels and jewelry belonging to members of the aristocracy of Russia reached Europe, when they escaped from the upheavals of the 1917 Bolshevik Revolution in that country. Catherine the Great Pearl Necklace inherited by a Romanov aristocratic family of Russia, would have reached France around this time, when the owner of the necklace escaped from Russia. These families uprooted from their homes in Russia, having lost all their lands, homes and other personal belongings, were soon running short of funds for their survival in their host countries, and were forced to sell the family jewels carried by them at the time of their flight. Thus Cartier was able to purchase the Catherine the Great Pearl Necklace from its owner around this time, apart from other pieces of jewelry purchased at the same time. 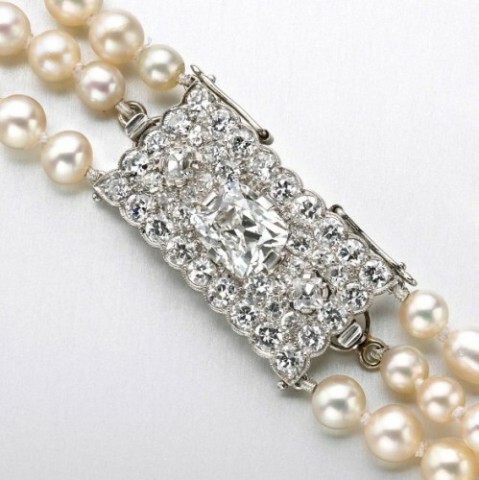 However, in the early 20th-century, pearls had the highest demand than any other class of gemstones. They were even more expensive than diamonds. One should not forget here that Cartier around this time purchased their Fifth Avenue headquarters in New York, only for a two-strand pearl necklace that cost $1,000,000. Thus Cartier dispatched the pearl necklace to their New York office, with a view of finding a suitable client from the newly rich industrialists of America, who were going in a big way accumulating rare artworks, artifacts and jewelry. The fact that the necklace contained a large number of natural pearls, whose origins were assigned to the late 18th-century (1762-1796), when natural pearls were found in abundance in the world. 4) Catherine the Great was one of the greatest collectors of artworks, artifacts and jewelry of the 18th-century, whose greatest legacy is the Hermitage Museum in St. Petersburg. During her lifetime she is said to have acquired 38,000 books, 10,000 drawings, 4,000 paintings, 16,000 coins and medals, 10,000 engraved gems, and a natural history collection filling two galleries. She was also a great collector of jewels and jewelry, and her personal jewelry collection included several pieces of pearl jewelry, including black pearls. Thus it was quite possible that the five-strand pearl necklace containing 389 oriental pearls belonged to Catherine the Great. During her period of reign between 1762 and 1796, oriental pearls were in great abundance, and putting together a collection of 389 natural pearls would not have been a difficult task, compared to a hundred years later, when production of natural pearls declined rapidly in the traditional pearling areas of the Persian Gulf, the Red Sea and the Gulf of Mannar, due to prolonged periods of exploitation running to several millennia. In fact the Gulf of Mannar pearling grounds were abandoned by the British at the beginning of the 20th-century around 1906. Thus the fact that the five-strand pearl necklace contained a large number of pearls, whose origins were assigned to Catherine's period in the late 18th-century, when natural pearls were found in abundance, is in itself a strong line of evidence to suggest that the pearl necklace originated during her period. How Catherine the Great's Pearl Necklace reached the west ? The foregoing account establishes to a reasonable extent the late 18th-century provenance of Catherine the Great's Pearl Necklace. If we accept that the pearl necklace originated during the period of the great Empress, the question then arises how this necklace came into the possession of jewelers in the west. The would-be fate of Catherine the Great's Pearl Necklace if it was part of the Crown Jewels of Russia. Since the time of Peter the Great in 1719, the jewels of the Romanov rulers of Russia were divided into two categories :- 1) Jewels belonging to the Russian State 2) Jewels belonging to the Romanov family. In 1719, Peter the Great created what was known as the "Russian Crown Treasury" the forerunner of the present day "Russian Diamond Fund," whose main purpose was to house a collection of jewels that belonged not to the Romanov family, but to the Russian State. He placed all state regalia in this treasury, and declared that the state holdings were inviolate, and could not be altered, sold or given away. He further decreed that each subsequent emperor or empress should leave a certain number of pieces acquired during their reign to the state, for the permanent glory of the Russian Empire. Accordingly, Peter the Great and his Romanov descendants, including Catherine the Great, swelled the coffers of the "Russian Crown Treasury" with a variety of jewels and jewelry, that included jewel-studded necklaces, brooches, bracelets, earrings and rings, and other royal paraphernalia, such as crowns, tiaras, royal scepters, swords etc. It appears that the Catherine the Great's Pearl Necklace was part of her personal jewelry and therefore was not included among the jewels in the "Russian Crown Treasury." Had the necklace been part of the Russian Crown Jewels, it would have been moved out of the "Diamond Chamber" in the Winter Palace at St. Petersburg, where it was housed together with the crown jewels, with the outbreak of World War I. Czar Nicholas II (1894-1917) the last of the Romanov rulers, ordered that the treasures in the "Russian Crown Treasury" be packed in crates and transferred to Moscow, where it was hidden in the underground vaults of the Kremlin Armory. Then followed the upheavals of the Bolshevik revolution of 1917, the overthrow of the monarchy, and the execution of Czar Nicholas II and his family. The treasures hidden in the underground vaults of the Kremlin Armory, were totally forgotten, until they were re-discovered in 1922. Part of the Russian Crown Jewels were sold outright to a consortium of British-American buyers, part of the jewels pledged to the Government of the Irish Republic, and part retained in the Diamond Fund. Vladimir Lenin, the leader of the Communist Party, and the Head-of-State of the Russian Socialist Republic, ordered the photographing and cataloguing of every single piece in the collection, which was later handed over to the custody of a specially created body, known as the Russian State Diamond Fund, under the Ministry of Finance. V. I. Lenin died in 1924, and the young Russian Socialist Republic had financial difficulties during the initial days of its founding. To overcome this problem, the Socialist Party, decided to sell part of the Russian Crown Jewels to a Consortium of British and American buyers, who in turn offered the items for sale at a Christie's auction held in London on March 16, 1927. The Catherine the Great's Pearl Necklace was sold to the American industrialist Horace E. Dodge in 1920, and therefore it could not have been part of the Christie's sale of 1927. Another part of the jewelry was pledged to the Government of the Irish Republic, but was never redeemed. Later in 1948, the Irish Government on its own decided to return the pledged jewels back to Russia as it was an integral part of its great cultural heritage. The jewelry returned from Ireland was then added to the remaining crown jewels in the State Diamond Fund in Moscow, where they are exhibited today. If Catherine the Greats's Pearl necklace was part of the Russian Crown jewels, it would have been either sold at the 1927 Christies's auction, or pledged to the Irish Republican Government, or remained as part of the Russian Diamond Fund. Thus, we now know for certain that the Catherine the Great's pearl necklace was not part of the Crown Jewels of Russia. In all probability the necklace was part of her personal jewelry collection, which was inherited by other Romanov rulers that succeeded her, and eventually came into the possession of Czar Nicholas II, or an aristocratic family related to him. Prior to and during the upheavals of the October 1917, Bolshevik Revolution, most of the aristocratic families of Russia, escaped to the western European countries like France, Great Britain, Italy and other countries, carrying with them their personal jewelry. Some emigrated to the United States from Europe. Such families settled down in their host countries, and converted the liquid assets they carried with them such as gold, diamonds, gemstones and jewelry into cash, that was needed for their survival. The Catherine the Great Pearl Necklace, is believed to be such a piece of jewelry brought into France during this period, and sold to Cartier's of Paris after the October 1917 revolution. Queen Mary, the Queen Consort of King George V, is credited with acquiring the Romanov jewels that once belonged to Russia's Dowager Empress Marie Feodrovna, sister of England's Queen Alexandra, who escaped the Russian revolution, and brought with her one of the most magnificent jewelry collections in the world. She also purchased the Grand Duchess Vladimir Tiara in 1921, from Princess Nicolas of Greece, the daughter of the Grand Duchess, after it was smuggled out of Russia by a British Intelligence Officer, together with other jewels belonging to the family of the Grand Duchess, retrieved from the Vladimir Palace, after the family had escaped to France. Grand Duke Boris, the son of Grand Duchess Vladimir, who inherited most of the Duchess' emerald jewelry after her death in 1920 in France, sold them to Cartier's of Paris, which was later purchased by Barbara Hutton in 1935. Prince Felix Youssoupov II, Rasputin's assassin, who also escaped from Russia in 1917, carried with him a collection of expensive pearl jewelry that included the "La Pelegrina" pearl, and some famous diamonds such as the "Polar Star Diamond," the "Sultan of Morocco Diamond," and the "Ram's Head Diamond, and a pair of ear pendants that belonged to Marie Antoinette. Prince Youssoupov sold most of his jewelry to Cartier's of Paris. Thus it appears that most of the jewelry brought into France by the Russian aristocratic refugees during the revolution, were purchased by Cartier's of Paris, and this perhaps included the "Catherine the Great Pearl Necklace." Horace Dodge and his brother John Dodge, were the co-founders of the internationally renowned automobile company, Dodge Automobiles, that was founded in the year 1913. Prior to the founding of the company the two brothers had set up a machine shop in Detroit in 1900, that produced parts for the automobile industry. In 1902, they won a contract to build transmissions for the Olds Motor Vehicle Company, that gave them a reputation for quality and service. Henry Ford who was impressed by the quality of work of the Dodge brothers, offered them a deal in 1903 to build engines for the company, that included a share position in the new Ford Motor Company. Their partnership with Ford was very successful and opened new opportunities for the brothers to build up their own automobile company. 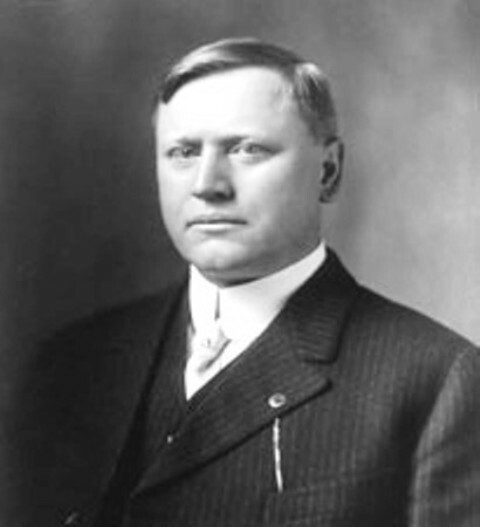 They worked for Ford for 10 years, while John Dodge served as the vice-president of the Ford Motor Company. In 1913, the brothers left Ford, and set up their own company, known as Dodge Automobiles, that produced motor trucks, ambulances, and other vehicles for the United States military, during World War I. By the end of the war the company manufactured and marketed both cars and trucks. Even after leaving the Ford Motor Company, the two brothers continued to hold their shares in the company, and in 1919 Henry Ford purchased the Dodge brothers' shareholdings in Ford Motor Company for $25 million. Horace and John received $12.5 million each from Henry Ford when the sale was concluded. It is said that on the successful conclusion of the sale, Horace Dodge promised his wife Anna Thomson Dodge, to buy any "earthly thing she wanted." Anna said that she wanted pearls, in keeping with the trends during that period, when owning and wearing pearl jewelry was considered fashionable, and pearls were more expensive than even diamonds. Horace agreed, and purchased the five-strand pearl necklace from Cartier's of New York, in May 1920, for a sum of $825,000, which he presented to his wife Anna Thomson. Just before the necklace was purchased, tragedy struck the family, when John Dodge died in January 1920, having contracted the fatal Spanish flu that spread across the world. According to another version of the events leading to the purchase of the Catherine the Great Pearl Necklace, Horace E. Dodge purchased the necklace for Anna Thomson in anticipation of their daughter Delphine's wedding to James Cromwell, son of Eva Stotesbury and stepson of Edward Stotesbury, partner of J. P. Morgan and prominent Philadelphia banker. 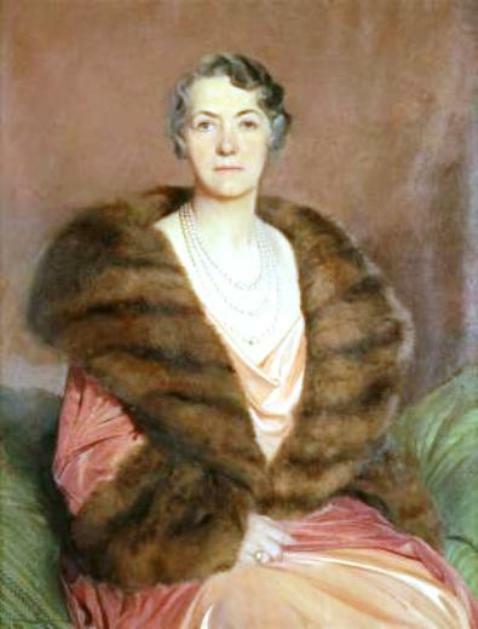 Whatever might be the true version of events that led to the purchase of the necklace, one thing of which we are certain of, is that Anna Thomson Dodge wore the necklace for her daughter Delphine's wedding in 1920, at which she is said to have dazzled some 3,000 guests and the Detroit Symphony Orchestra, major benefactors of Horace and Anna Dodge's magnanimity, who played throughout the reception. Unfortunately, Horace Dodge also died in December 1920, just six months after his daughter's marriage due to complications of pneumonia having contracted the same flu that killed his brother in January of the same year. James H. R. Cromwell's marriage to Delphine Dodge lasted only 8 years and they were divorced in 1928. They had a daughter by this marriage named Christine, who was born in 1923. Anna Thomson gives the necklace to her grand-daughter Yvonne Baker Ranger, who breaks up the necklace, but later three strands are re-united to give a three-stranded necklace ? In 1968, two years before she died, Anna Thomson gave her pearl necklace to her grand daughter Yvonne Baker Ranger, who was born in 1933 after Delphine's second marriage to Raymond Baker. According to most of the websites advertising the sale of the three-strand Anna Thomson pearl necklace that was to come up on December16, 2008, including a write-up on the history of the necklace by Bonhams, the auction house that was to conduct the sale, Yvonne Baker Ranger who acquired the necklace from Anna Thomson Dodge, divided the strands among her friends and heirs. Three of these family members then decided to reunite their individual natural pearl strands, to sell as one three-stranded necklace, at the Bonham's auction that was coming up on December 16, 2008. This gives the impression that the three strands were put together sometime before the auction in the same year 2008. However, Bonham's had also released a photograph of Anna Thomson wearing the three-strand pearl necklace through the website Pearl-Guide.com, apparently taken before she died on June 2, 1970, at the age of 103 years. Thus, there appears to be a contradiction between what appears in the photograph and the account of the necklace being put together by three of the Dodge family members. If we accept what appears in the photograph as the true position, the three-stranded pearl necklace had already existed before 1970, the year Anna Thomson died, in which case the five-stranded pearl necklace was converted to three strands during Anna Thomson's life time. Thus, the account of the three-stranded pearl necklace being put together by three members of the Dodge family, just before the sale of the necklace in December 2008, cannot be sustained. Anna Thomson's photograph tells the whole truth. The three-stranded pearl necklace undoubtedly existed before 1970, and the five strands became three strands during her life time. Thus when Yvonne Baker Ranger received the necklace from her grandmother Anna Thomson, it must have been already a three-stranded necklace. The descendants of Horace E. Dodge and Anna Thomson Dodge, who owned the three-strand natural pearl necklace, made up of 224 pearls and two Cartier diamond clasps, entrusted the necklace for sale to Bonhams, one of the world's oldest and largest auction houses, dealing in fine art and antiques, with an extensive network of offices around the world. The auction was fixed for December 16, 2008, at Bonham's prestigious sales rooms, on New York City's Madison Avenue, and was preceded by a worldwide advertising campaign both online and offline. The magnificent pearls were put on display at Bonhams offices in New York City, San Francisco, Los Angeles, Dubai, Paris and London, prior to the sale. A pre-sale estimate of $500,000 to $700,000 was placed on the necklace. According to the Bonhams website www.bonhams.com the Anna Thomson Dodge/Catherine the Great three-strand pearl necklace was sold at the December 16, 2008 auction, for a sum of $600,000, within the range of the pre-sale estimate. The identity of the buyer was not disclosed. The Anna Thomson Dodge/Catherine the Great Pearl Necklace that was purchased by automobile tycoon Horace E. Dodge in 1920 from Cartier's of New York, for $825,000, was finally sold in its modified form for only $600,000 in December 2008, sending shock waves around the pearl markets of the world, especially among antique dealers selling antique natural pearl jewelry. The sale price realized for this antique necklace was particularly a cause for worry among natural pearl enthusiasts as the trend towards the end of the 20th-century and the beginning of the 21st-century was towards a strong auction market for natural pearls, where the final prices realized far exceeded the pre-sale estimates. The following table of renowned natural pearls or pearl jewelry, giving the prices realized at their last auction clearly bears out this trend. Possible causes for a lower auction bid when exactly one year ago in December 2007, a single-strand natural pearl necklace consisting of only 28 pearls set a world record price of $3.6 million. 1) Modification of the original five-strand pearl necklace to a three-strand pearl necklace, decreasing the number of pearls from 389 to 224, and removing the enameled clasp carrying a miniature portrait of Catherine the Great. 2) Doubts cast on the historic provenance of the necklace, associating it with Empress Catherine the Great of Russia. 3) The effect of the on-going recession affecting the strong auction market for natural pearls. The first of these causes, tampering with the original integrity of the necklace, may command some merit, but an examination of the table above shows, that item no. 11, the famous Baroda pearl necklace, which was severely tampered with, reducing the number of strands from seven to two, and the number of pearls from approximately 350 to 68, fetched the highest price so far for a natural pearl necklace at an auction, a staggering 7.1 million USD, at a Christie's auction held in New York, in April 2007. The second cause, questioning the historic provenance of the necklace, might also be a contributory factor, but an examination of the above table shows, that item nos. 13 and 14, natural pearl necklaces whose identity and historic provenance was not revealed, fetched very high prices of USD 1,321,110 and USD 946,610, at an auction held in Geneva in November 2008, just one month before the auction of the Anna Thomson pearl necklace. The third cause, effect of the on-going recession on the auction market for natural pearls, doesn't seem to have any merit at all, because sale of items bearing numbers 12 downwards, starting from the Umm Kulthum pearl necklace, had taken place in 2008 and 2009, when the recession was still holding sway across the whole world. In fact sale of the last item, the Pearl Carpet of Baroda, made up of 1.5 to 2 million natural seed pearls, for a staggering 5.5 million USD, took place only in April this year, while the world was still experiencing the ill effects of the recession. The fourth cause the non-attendance of natural pearl enthusiasts and collectors might have been a contributory factor, but details reports of the auction are not available for a critical analysis. Thus apart from the above four factors, some other unknown factors might have been responsible for the decreased price realized by the sale. Horace Elgin Dodge, a pioneer of the American automobile industry, who together with his elder brother John Elgin Dodge (born 1864), founded the Dodge Automobile Company in 1913, was born on May 17, 1868, in Niles, Michigan, where his father owned a foundry and machine shop. The birth of Dodge brothers, Horace and John, to an industrially oriented family, gave them the benefit of an early industrial and technically-oriented training, that laid the foundation for great and phenomenal achievements in the future, that not only benefited them personally in acquiring great wealth, but also human kind as a whole by providing them a cheaper and reliable form of transport. The two brothers had been inseparable as children, and had remained partners for life and died within an year of one another, affected by the same influenza epidemic that devastated the nation in the 1920s. The evolution of their career from boiler maker plant technicians, to machinists, bicycle manufacturers, manufacture of automobile parts, manufacture of automobile engines, and finally complete automobiles. In 1886, the young Dodge brothers moved to Detroit, where they took up jobs at a boiler maker plant. Later in 1894, they worked as machinists at the Dominion Typograph Company, situated across the Detroit river in Windsor, Ontario. Even though the two brothers had a mechanically oriented training, John Dodge was more inclined towards sales and management, while Horace was a gifted mechanic and tinkerer. In 1897, Horace invented and patented a dirt-proof ball bearing, which helped John to work out a deal with a third party investor to manufacture bicycles. However, after three years they sold their business, and using the proceeds of the sale they set up their own machine shop in Detroit in 1900, manufacturing parts for the automobile industry. The Dodge brothers received their first big break in 1902, when they secured a contract from the Olds Automobile Company to supply 3,000 automobile transmissions, following the re-organization of Old Automobile as an assembly company, following the fire disaster that destroyed the Olds manufacturing plant in Detroit in March 1901. However, the very next year they refused to sign a second contract with Oldsmobile, and instead entered into a deal with Ford Motor Company to build engines for them, that also included a share position in the company. Their association with the Ford Motor Company was so successful, that in 1910 they built a new plant in Hamtramck, Michigan. 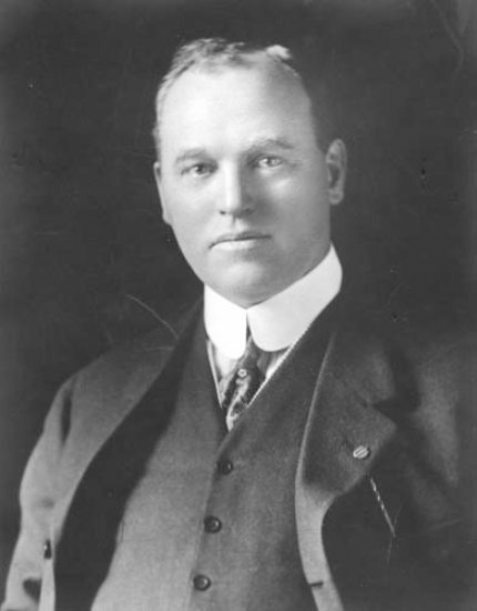 The Dodge brothers association with Ford as suppliers lasted for 10 years, and during this period, John Dodge served as the vice-president of Ford. In 1913, Dodge brothers broke off their partnership with Ford, in order to concentrate on their lifetime dream of producing a Dodge automobile. Their entry into the automobile manufacturing business fortunately coincided with the build up of arms for World War I, and Dodge Automobile Company, was commissioned by the United States military, to build motor trucks, ambulances, and other vehicles for them. In October 1917, the company produced their first commercial car, and by the time the war ended, the company was producing both cars and trucks, becoming the third largest producer of automobiles in the United States. In 1919, the Dodge Brothers sold their shares in the Ford Motor Company for $25 million. Horace E. Dodge married Anna Thomson in 1896, a Scottish immigrant, born in Dundee. They had a daughter Delphine Dodge born in 1899 and a son Horace Jr. born in 1900. Delphine Dodge married James Cromwell, son of Eva Stotesbury in 1920, by whom she had a daughter Christine Cromwell born in 1923. The marriage ended up in divorce after 8 years in 1928. Delphine took two more husbands during her life time, Raymond Baker, by whom she had a second daughter Yvonne Baker, and Timothy Godde. Delphine died in 1943, at the age of 44 years. Horace Dodge Jr. took five wives during his life time, and had two children by his first wife, Lois Knowlson, two children by his second wife, Muriel Sisman, and one child by his fifth wife, Gregg Sherwood. He died n 1963 at the age of 63 years. Anna Thomson outlived her husband, and both her children and died only in 1970, at the age of 103 years. A speedboat and yachting enthusiast, Horace, while working for Ford, pursued simultaneously his interest in building more powerful and faster yachts and speedboats, building one of the fastest speedboats on the Great Lakes, the forty-foot "Hornet" in 1912. 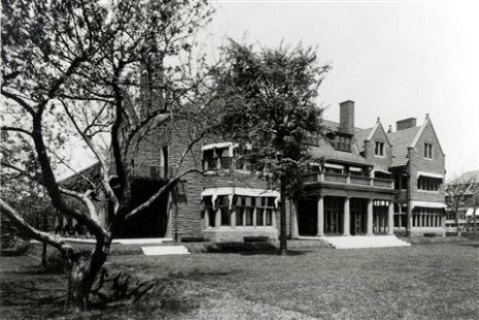 In order to be closer to the water to pursue his interests in yachting, Horace purchased land adjoining the Detroit Country Club, where he built his mansion called "Rose Terrace" in 1912, designed by Albert Kahn, with a boat dock, overlooking Lake St. Clair. He also acquired a large winter estate in Palm Beach, Florida. In 1913, he built a second 180-foot yacht known as Nokomis, that was followed by a still larger yacht in 1915, known as Nokomis II. Finally he built the largest and fastest yacht on the Great Lakes, the 267-foot "Delphine" named in honor of his daughter, which he commissioned in 1920, the year he died. The year 1920 turned out to be a fatal year for the Dodge brothers, both of whom were still quite young, John 56 and Horace 52; the year the enterprising and industrious brothers who together chartered a difficult and competitive course in life, had their date with destiny. In January of that year, the two brothers who were still hale and hearty, and bubbling with enthusiasm about future plans for their company, left for New York to attend the Auto Show. Unfortunately, this was the period when the worldwide influenza pandemic that began in 1918, known as "Spanish flu" was still raging and claiming victims worldwide. Unlike other influenza outbreaks which predominantly affected juveniles, elderly and the weak, most of the victims this time were the healthy young adults. 99% of the influenza deaths occurred in people under 65 years of age, and out of this more than 50% were young adults between 20 and 40 years of age. The virus caused massive hemorrhage and edema in the lungs, causing death directly, or setting the stage for a secondary infection, bacterial pneumonia, that usually caused death. The infection rate was very high, up to 50% and the mortality rate was 10-20% of those infected. A third of the world population was infected and around 3-6% of the entire global population died. The estimated deaths were 50-100 million people worldwide. Recent research conducted by scientists had shown that the extreme severity of the symptoms and deaths were caused by what are known as "Cytokine Storms" which simply means, the overreaction of the body's immune system. This explains the unusually severe nature of the symptoms, and why it affected young adults between 20 to 40 years, whose strong immune system ravaged the body. The two Dodge brothers who were still strong and healthy, contracted the fatal influenza, while at New York. While John succumbed to the deadly infection and died on January 14, 1920, Horace luckily survived. Horace was devastated by his brother's death, who had been his friend and companion throughout his life. He never recovered fully from his sickness, contracting pneumonia that eventually killed him on December 10, 1920. Fate had dealt a cruel blow, and ended tragically the lives of two enterprising Americans, who helped brighten the lives of millions of other Americans and other people across the world. The two brothers were interred in the family mausoleum in Detroit's Woodlawn Cemetery, with two Sphinx statutes placed between their graveyard. Her birth, her marriage and children and her husband's transformation from an ordinary machinist to an automobile manufacturer. Anna Thomson was a Scottish immigrant to the United States, who was born in Dundee, Scotland, on August 7, 1867 or 1871. She married Horace E. Dodge in July 1896, who was then working as a machinist for the Dominion Typograph Company. After her marriage, Horace and John Dodge together with a third party investor set up a plant to manufacture bicycles. Their first child, a daughter named Delphine, was born in 1899, followed by their son Horace E. Dodge Jr. in 1900. These were the only two children born to Anna and Horace in their 24 years of married life. By 1900, the Dodge brothers had set up their own machine shop in Detroit producing parts for the automobile industry. From then onwards until 1913, was a series of success stories; first the contract with Oldsmobile to supply automobile transmissions; followed by the partnership with Ford Motor Company for 10 years to build engines; the building of the 5.1-million-square-foot Dodge Main Complex in 1910; that led to breaking of the partnership with Ford and the setting up of their own automobile manufacturing plant in 1913. By 1920, the Dodge Automobile Company was the third largest producer of automobiles in the United States. After the untimely death of the Dodge brothers in 1920, the two widows Matilda and Anna became the heiresses to one of America's great automotive fortunes. In 1925, the two widows together sold the automobile company Dodge Brothers, to the investment banking firm Dillon Read & Co. for $146 million, each of them receiving $73 million by this transaction. In addition Anna also received an annual income of $1.5 million, tax-free for life, from an investment in municipal bonds, made by her husband before his death. Thus Anna Thomson became one of the richest women in the world at that time. Anna Thomson purchases a mansion for her only son Horace Dodge Jr. and builds a second "Rose Terrace" after demolishing the first "Rose Terrace" built by her husband Horace Dodge. In 1926, Anna Thomson purchased "Charles Swift House" adjoining her own residence "Rose Terrace" and gave it as a gift to her son Horace Dodge Jr. Horace Jr. resided in this house whenever he visited Grosse Pointe, until his untimely death in 1963. The house was then owned by Anna Thomson's grand daughter Mrs. Yvonne Ranger, until it was demolished in 1985. In 1926, Anna Thomson Dodge remarried, and her second husband was actor Hugh Dillman. The couple lived in "Rose Terrace." In 1930, they decided to demolish the old "Rose Terrace" and build a second home by the same name. The second "Rose Terrace" was based on the plan of a mansion known as "Miramar" in Newport, Rhode Island. The 50,000 sq. ft. mansion that was built during the great depression was completed in 1935, and became one of America's most luxurious residences, filled with original European works of art and antiques. The collection rivaled some of the museums and private collections, in America and rest of the world. Her death in 1970 at the age of 99 years or 103 years ? Anna Thomson Dodge died peacefully on the night of June 2, 1970, in her silk-walled bedroom in Rose Terrace, at the age of 99 years according to some authorities, and 103 years according to others. She outlived her husband Horace, both her children Delphine Dodge and Horace Dodge Jr., her second husband actor Hugh Dillman, her brother-in-law John Dodge, her sister-in-law Matilda Dodge, as well as many nieces, nephews and cousins. She was interred in the Dodge Family mausoleum in the Woodlawn cemetery, Detroit. Anna Thomson bequeaths her collection of artworks, antiques and furniture to the Detroit Institute of Arts and the Getty Museum, Los Angeles, and leaves funds for several charities in Detroit. At the time of her death she bequeathed most of her collection of fine furniture, artwork and antiques to The Detroit Institute of Arts, and J. Paul Getty Museum in Los Angeles, California. She also left funds in her will to various Detroit charities, concert halls, churches and hospitals. She also left $2 million to the city of Detroit, to build a memorial in memory of her late husband and son. Anna Thomson who was a self taught violinist and pianist, was together with her husband a major benefactor of the Detroit Symphony Orchestra, and played a key role in the construction of the Orchestra Hall in 1919. Even after her husband's death she continued to support the Detroit Symphony Orchestra. Attempts to donate "Rose Terrace" to the Detroit Institute of Arts, but offer not accepted. Community efforts to save "Rose Terrace" also fails. Finally Rose Terrace is demolished, by a developer, to make way for a housing project. Long before her death in 1964, Anna Thomson wanted to donate her residence "Rose Terrace" to the Detroit Institute of Arts, but they refused to accept the offer without an endowment for its upkeep and maintenance, which was said to be around $12,500 a month. After her death, her heirs offered the building again to the D.I.A. but the offer was again refused. The mansion was put up for sale in 1971, with an asking price of $1.2 million, much less than the $7 million it cost to build and furnish, but there were no takers. Finally, after being on the market for several years, and a community effort by the people of Grosse Pointe to save "Rose Terrace," the great house was sold to a developer, who demolished the building in 1976, to make way for a new housing project. The building would have been ideally used for an automobile museum, to showcase the evolution of the automobile industry in the United States, and the contribution made by the Dodge brothers in building up this industry, thus helping to perpetuate their memory for the future generations. The unfortunate demolition of Rose Terrace was tantamount to the demolition of part of the industrial history of the United States of America !!! 9) Terrified by the Pearls She Dare Not Wear - THE LIMA NEWS, Lima. Ohio, 1922.